This cell is preparing to divide. 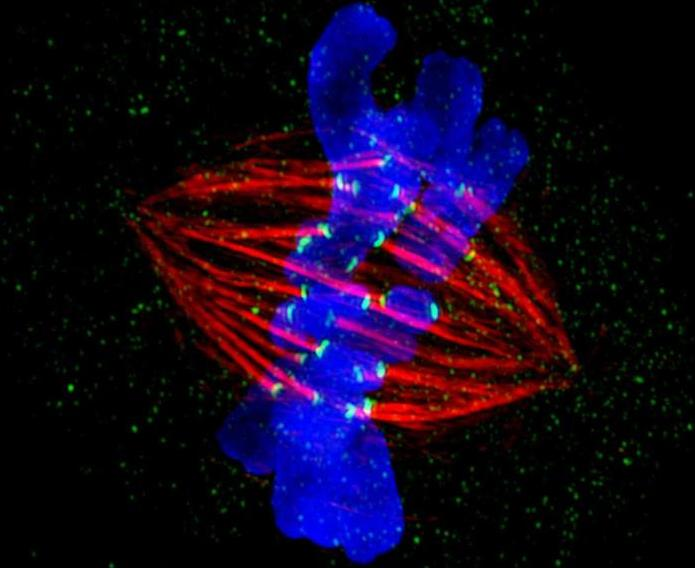 Two copies of each chromosome (blue) are lined up next to each other in the center of the cell. Next, protein strands (red) will pull apart these paired chromosomes and drag them to opposite sides of the cell. The cell will then split to form two daughter cells, each with a single, complete set of chromosomes. Image and caption credit: Jane Stout, Indiana University, 2012 GE Healthcare Cell Imaging Competition winner. Although some proteins have a single career, many—like Dis3—lead a double life. In the yeast Schizosaccharomyces pombe, loss-of-function mutations in dis3 cause defects in mitosis, implying that Dis3 normally supports cell cycle progression. But perplexingly, results in humans suggest that Dis3 normally slows cell cycle progression: mutations that partially disable dis3 contribute to the development of multiple myeloma, a type of plasma B cell cancer. In the June issue of GENETICS, Snee et al. propose a model that unites these seemingly incompatible findings. Consistent with the yeast results, the researchers found that fruit flies with no dis3 function die as young larvae; at the second larval instar stage, development grinds to a halt. During larval stages, the team observed that clones of wild-type fly cells divided an average of four times over 48 hours. In contrast, clones of dis3 loss-of-function cells divided only once, and this single division is likely supported by residual wild-type Dis3 protein in the clones. These findings suggest that Dis3 normally helps propel cells through the cell cycle, seemingly at odds with the fact that mutations dampening its function are common in some rapidly-dividing cancer cells. But not all mutations affecting dis3 behaved the same way. The researchers also examined a mutant that showed a marked reduction in dis3 function, as opposed to complete loss of function. Flies with this mutation were mostly normal—but interestingly, they had an unusually large number of posterior follicle cells, which are involved in egg formation. This made them suspect that dis3 might function with the EGF-Ras-ERK pathway, which is involved in specifying posterior follicle cell fate. To investigate this possible relationship, they tested whether the reduced-function dis3 mutant would still boost follicle cell growth when they diminished the function of gurken, which triggers the EGF-Ras-ERK pathway. When gurken function was reduced, the dis3 mutant produced normal numbers of posterior follicle cells, supporting the hypothesis that dis3 interacts genetically with the EGF-Ras-ERK pathway to regulate cell proliferation. Interestingly, they also found that elevating EGF-Ras-ERK pathway activity in other cell types containing reduced dis3 function also produced tissue overgrowth. This shows that reduced dis3 function can enhance cell proliferation in developmental contexts unrelated to follicle cells. The fact that dis3 might behave differently under distinct conditions—promoting cell division in one case and suppressing it in another—could explain the discrepancy between its roles as cell proliferation promoter and suppressor. In search of a mechanism, the researchers considered the functionally related gene dis2, which also regulates mitosis. During mitosis, Dis2 initially delays anaphase and cell cycle progression until all sister chromatids are bi-oriented on the mitotic spindle. Once this criterion is met, Dis2 is directly phosphorylated and inhibited by CDK-1, and as a result, anaphase is triggered and the cell cycle continues. This complete shutdown of Dis2 activity is required for cell cycle progression, yet reduction of Dis2 activity has been implicated in premature mitotic entry. In a striking parallel to Dis2, Snee et al. found that CDK-1 phosphorylates Dis3 and inhibits its RNase activity. During mitosis, Dis3 may act similarly to Dis2, with Dis3 activity being essential for one event in mitosis while its inactivation is required for a subsequent step. Thus, reduction, but not elimination, of dis3 activity may allow the cell to proceed normally through the Dis3-dependent mitotic event, but inappropriately speed through the later steps that require complete inactivation of dis3. If further study confirms this model, dis3’s supposed double life may not be so paradoxical after all. Snee, M.; Wilson, W.; Zhu, Y.; Chen, S.; Wilson, B.; Kseib, C.; O’Neal, J.; Mahajan, N.; Tomasson, M.; Arur, S.; Skeath, J. Collaborative Control of Cell Cycle Progression by the RNA Exonuclease Dis3 and Ras Is Conserved Across Species.